It’s yesterday’s news that the Piano Guys, with more than 134 million total YouTube views under their belts, are worldwide Internet sensations. The Utah group now has a famous mogul as its manager and has signed with Sony Masterworks recording label, with a self-titled debut album release on Oct. 2. And KUED will tape a live Piano Guys concert at the Red Butte Garden Amphitheatre on Wednesday, Sept. 19, that will be broadcast locally in December with a national PBS broadcast set for the spring of 2013. Not bad for five laid-back, middle-age men who only turned to YouTube in order to promote piano sales at a small St. George Yamaha Piano dealership. The aspect that sets the Piano Guys apart from other YouTube-promoted one-hit wonders and primarily accounts for their staggering online popularity are the elaborate, nearly poetic videos, often filmed with remote-controlled aerial cameras to highlight the postcard-perfect surrounding scenery. The primary performers on their YouTube channel, which boasts 757,000 subscribers (and grows daily to the tune of 2,500 members), are pianist Jon Schmidt and cellist Steven Sharp Nelson. Anderson completes the group with studio engineer and co-writer Al Van Der Beek and a second videographer, Tel Stewart, who was a piano mover at Anderson’s store while studying at Dixie State College. The Piano Guys’ brilliantly produced videos are what caught the attention of Shelley Ross, best known for her 17 years at ABC News, and convinced her husband, music executive David Simone, to seek out the group. While the two names may not be known in flyover states, Simone and Ross form a true power couple in media circles. Simone is a former president of PolyGram Music Publishing and past executive at Geffen Records who managed Barry Manilow, Elton John and the Beastie Boys. Ross is three-time Emmy Award winner who is credited with "changing the landscape of morning, prime-time and late-night TV." With well-connected management in place, the Piano Guys will perform for the first time on national TV on Katie Couric’s new daytime show on Sept. 17 and five seats on Jay Leno’s couch have been reserved. A national tour is in the works for next spring. The concert will be a pull-out-all-the-stops production, with Ross serving as executive producer of the taping. Viewers can anticipate contributions by a children’s choir, the Lyceum Orchestra and popular soloist Alex Boye. 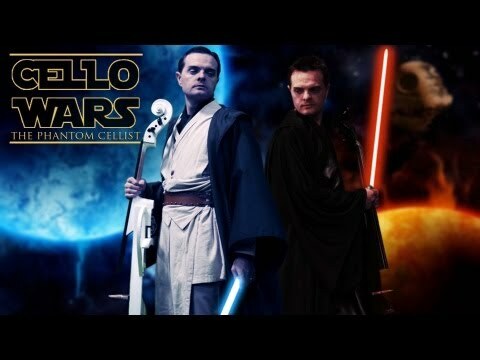 And characters from “Star Wars” — to accompany the group’s “Cello Wars” with a battle between a light saber and cello bow. The concert production is historic for bringing together a first-ever collaboration between two competing PBS outlets, KUED and KBYU. “It’s been a wonderful process working with KBYU and general manager Derek Marquis. This is something we couldn’t pull off without their support,” Dunn says. While the programming at KUED and KBYU is different from each other, “at the core, our missions are the same, to inspire and uplift,” he adds. That’s also the objective of the Piano Guys. “Music can uplift and clear the mind, and it can inspire,” Anderson says. “We want to make sure that in every song we do people can feel something, feel that they can achieve more than what they normally would do. Through music, people can recognize the worth that they individually have.